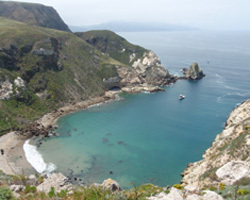 Discover the wonders of the Channel Islands as you join CMA educators on an adventure to Santa Cruz Island, part of the Channel Islands National Marine Sanctuary. Board the vessel in Ventura and enjoy a narrated voyage, observing sea life along the way. We’ll cruise along the island coast, then go ashore where participants will follow along on a naturalist-led hike to observe the diverse coastal habitats and panoramic views.